Speaking of South Korea, everyone has heard that the cosmetic surgery industry is famous in the world, and many beauty lovers from all over the world choose to come to Korea for plastic surgery. South Korea’s cosmetic injectable industry is also known for its price-preferential and skillful techniques. The low price is based on Korea’s independent research and development of hyaluronic acid dermal fillers manufacturing technology, producing a variety of price competitive, high-quality hyaluronic acid dermal fillers. South Korea’s hyaluronic acid dermal filler is not only popular in South Korea’s local plastic surgery clinics, but also exported to Europe, Southeast Asia, China, the Middle East, South America and other places, and is known in the world for its affordable price and high quality. However, even thought there are a lot of brands out in the market, but the quality will be very different depends on brands. The best quality of Korean dermal filler brands are usually the ones with Europe CE certification, the ones with CE mark are not as much, we have a list here and basic introduction of each of them. Hyaldew is one of the famous brand in Korea known for its patented micro beads cross-linking technology. For dermal fillers itself, cross linking technology is the most important step in the history of hyaluronic acid dermal filler development. Hyaluronic acid with cross linked last much longer, and the technology to make the cross linking also makes a differences when it comes to molding, it makes the filler stay in shape. 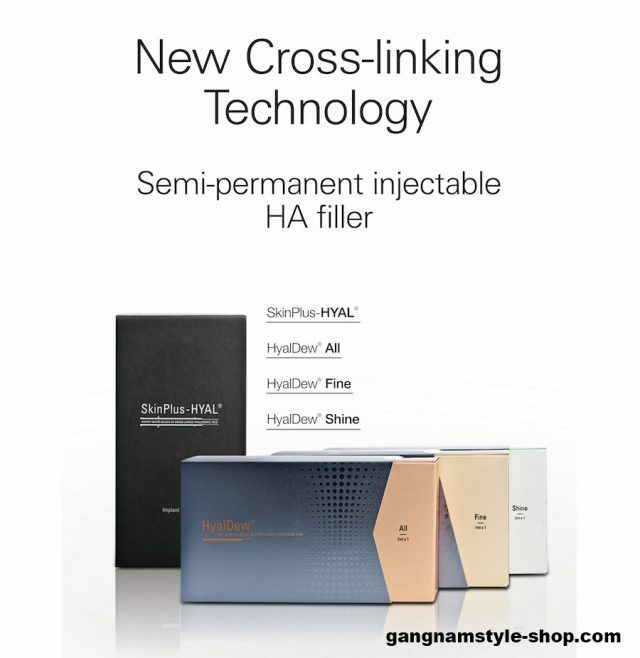 Hyaldew dermal filler has overcome the conventional Cross-linking technology by applying the patented Multi-staged Cross-linking technology to create three layered small beads that resolves the difficulty of creating a long-lasting HA Filler. This allows for a long-lasting filler even though the product itself is 100% Hyaluronic Acid. 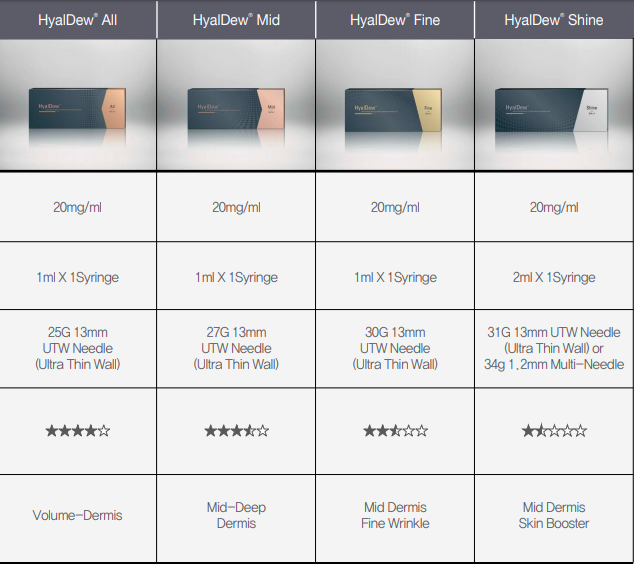 Hyaldew’s premium product SkinPlus-HYAL can last up to 5 years, and it is made of pure Hyaluronic Acid which can be dissolve by injecting hyaluronidase.SkinPlus-HYAL is the hardest of all product and biggest particle size with increased stability and long lasting effect. It is the only HA dermal fillers in the world that last up to five years. The rest of Hyaldew products come with Hard, Modium and Soft as in All, Mid and Fine. HyalDew can be used for augmentation, deep folds, fine wrinkles, lips and as a mesotherapy product. Applying the MCL technology the products are longer-lasting, easily moldable resulting in a very natural finish that will satisfy the client. REVOLAX dermal filler is another famous brand in Korea with the Europe CE certification. They are biodegradable, non animal filler with only the highest purity of Hyaluronic Acid through bio-fermentative origin to adding volume to facial tissue, thus improving wrinkles and folds and restoring a smooth appearance to the face. Revolax has a monophasic structure of regular and dense lattice which allows consistent smooth injection throughout the treatment. 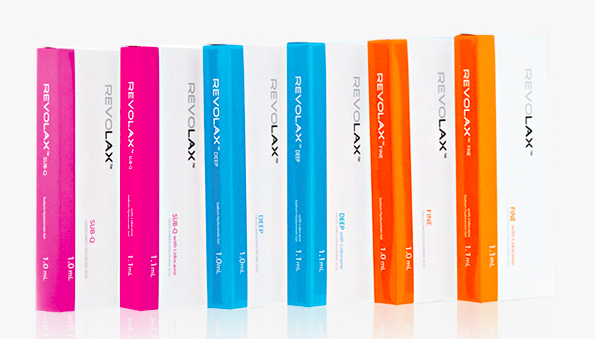 Revolax has a unique cross linking technology that does not need free hyaluronic acid to adjust the physical property of its gel formula. Revolax has a stringent quality check process that completely removes all traces of the crosslinking agent BDDE from the finished product, through its rigorous dialysis process. Which makes Revolax no harms to the body and it is 100% safe to use. Revolax comes with Sub Q, Deep and Fine. Revolax Sub Q with its advanced ability to mold, maintain structure and longevity, it is recommend for treatment of deep sized to extremely severe wrinkles including nasolabials and face (cheek, chin, lip, or nose) contours. 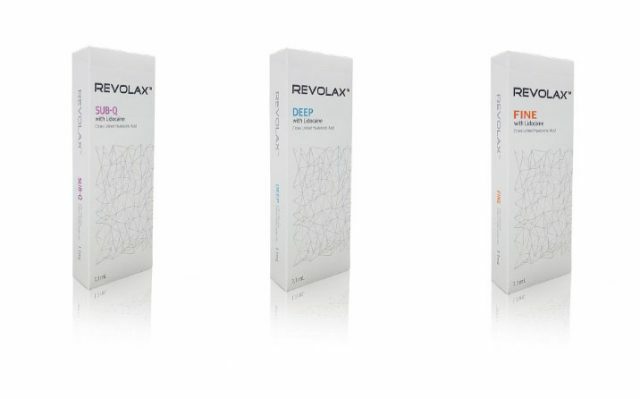 Revolax Deep is a thicker and longer lasting gel to treat deep sized wrinkles and folds of nasolabials or augmentation of cheeks, chin, and lips. Revolax fine for treatment of superficial lines. Including crow’s feet, glabellar lines, or neck wrinkles, it is the most soft in the product line. This entry was posted in korea fillers, korean dermal fillers.